A tall, handsome young man in a blue velvet blazer and a thin black tie walks onto the stage. In a single moment, the silence of the crowd disappears as though Justin Timberlake had come to Pacific Union College. Girls scream; boys applaud. The 400 students packed into Dauphinee Chapel give PUC alum Tad Worku the warmest welcome back home. The highly anticipated performance by the former business major and his band of four full-time musicians (whom he calls "psychotically gifted") was undoubtedly the event of the weekend. 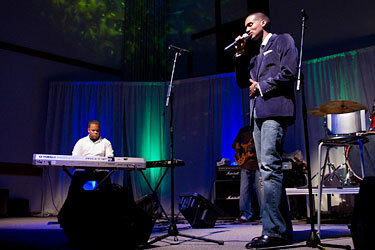 Worku’s band, consisting of Marcus Phillips on the bass, Nate Mercereau on the guitar, Q Jackson on the drums, and gospel keyboardist Dave Jackson, left the stage with the audience on their feet. The group played a set of 10 songs, ranging from pieces Worku wrote for other artists in the time he worked for production companies to his very first composition “Stormy Weather,” which he wrote as an 18-year-old freshman at PUC. Worku, who graduated in 2008, currently works full-time on his music in San Francisco, recording two to three times a week and playing shows bi-monthly.